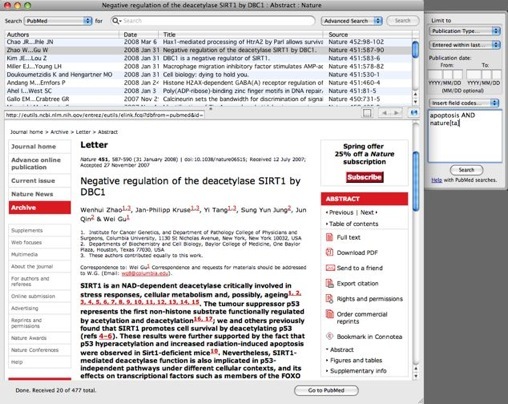 Reference Miner searches the Internet to find and display reference information from PubMed, Amazon (US, UK, Germany, France, Canada, and Japan), Google Scholar, and the Library of Congress. Special features include the display of book cover art (Amazon) and the ability to easily perform complex searches. If you or your institution has the appropriate journal subscription, a double-click immediately opens the PubMed full-text article in your browser. Special features include a built-in web browser (reference surfing), with drag and drop download of pdfs (requires institutional access privileges) and web pages from PubMed, Amazon, and Google Scholar, and the display of book cover art (Amazon). Note: The Internet search features of Reference Miner, and much more, are built into Bookends.